Outlook’s Reading pane—a.k.a. Preview pane—displays the text of a message you’ve selected, preventing you from having to open the actual message to work with it. Here’s how to customize the Reading pane to suit your needs. 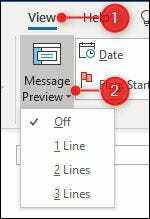 Outlook comes with several different panes, including those you see by default—the Navigation pane, for example—and others you might not bother with much—like the To-Do and People panes. Each of these is designed to make it easier to find, see, and manage things in Outlook. We’re going be taking a look at these panes throughout several articles, showing you how to access, work with, and customize them. And we’re starting with the Reading pane. The Reading pane is enabled by default. When you click on a message in any folder, the pane displays the contents of that message, along with basic controls for replying and forwarding the message. By default, Outlook shows the Reading pane to the right of the folders and messages, but you can change this by going to View > Reading Pane. 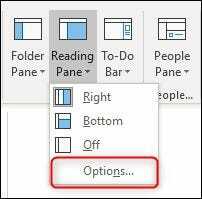 Your options are to change the position to “Bottom” (so Outlook shows the Reading pane below messages) or “Off,” which hides the Reading pane. 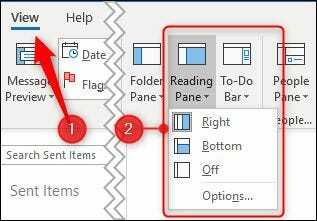 These options apply to the Reading pane no matter what folder you’re in, so you can’t set a different position setting for different folders. Setting the pane to “Bottom” means you see fewer messages in the folder, but you see more details about that message and more of its content in the Reading pane. This was the traditional view before the advent of wide-screen monitors, and many people still favor it. Setting the pane to “Off” maximizes the number of items you can see in the folder, but you don’t see any of the mail content. This is a useful option if you’re clearing out mail, especially if you use it in conjunction with the View > Message Preview function. In the standard folder view, Message Preview is turned off. This means that you just see the information shown in the columns in the folder—To, From, Subject, Received, and so on. But if you set Message Preview to 1 Line, 2 Lines, or 3 Lines, you’ll also see 1, 2 or 3 lines of the content of each message, without needing the Reading pane. Some people love this setting; some find it too cluttered. You’ll have to experiment with it to see what you think. Of course, this being Outlook, there are other ways to access these options. You can also go to File > Options > Mail > Reading Pane (or Advanced > Reading pane) to open the same options. Whichever way you choose, the Reading pane window will appear. Out of the box, Outlook will “Mark items as read when viewed in the Reading Pane” after five seconds. You can change this time to anything from zero (i.e., it’s marked as read immediately when you select it) to 999 seconds. If you want Outlook to wait more than a few seconds then you might prefer the second option, “Mark item as read when the selection changes.” This is an either/or situation: you can tell Outlook to mark items as read after a particular time, or you can tell Outlook to mark items as read when you move to another item, but not both. The next option, “Single key reading using space bar” is really useful if you like to navigate using the keyboard. When you reach a message that’s longer than the Reading pane can show, you can hit the space bar to move down a page in that message. When you reach the end of the message, hitting spacebar moves to the next message. This works well in conjunction with using the Up and Down arrows to navigate through your folder—they let you move through the folder, and the spacebar lets you move through the selected message. Finally, there is the “Turn on automatic full-screen reading in portrait orientation” option. This is for tablet users, and if it’s switched on then when your tablet is in portrait orientation, clicking a message minimizes the Navigation pane, hides the reading pane, and displays the selected message using the full screen. This won’t work if you select the message using the Up and Down arrows or the spacebar—only if you select the message using the trackpad/mouse or your finger. 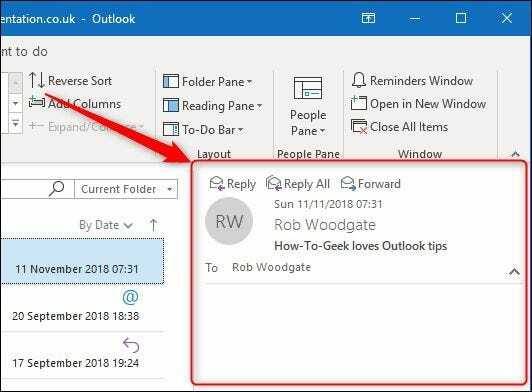 If you’re not working in portrait orientation and you want a little more screen real estate to view your messages, you can switch to Reading mode by clicking on the icon at the bottom of the Outlook window. This minimizes any other pinned panes—Navigation, To-Do, and People—to let you focus on your messages. You can display the panes again by clicking the Normal mode icon. The Reading pane can also help you read messages that are in a smaller than usual font, or if—as we’ve occasionally done—you’ve left your reading glasses at home. Use the Zoom control at the bottom of the Reading pane to increase the size of the contents (or make it smaller if it’s too large). You can also zoom by holding Ctrl while using the scroll wheel on your mouse. 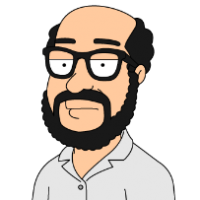 This works on a per message basis, so if you increase the size of one message, the zoom level on the next message you select will still be 100%. 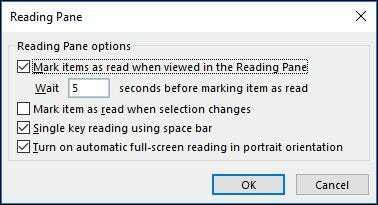 The Reading pane is a simple but fundamental part of the Outlook app, with plenty of useful features to help you shape your reading experience the way you want it. If you’ve traditionally turned it off then now might be a good time to turn it back on and see if it can help make your workflow a little more pleasant and efficient.